UPDATE: This has been one of the most popular posts on our site so we decided to update it with the most current information. And remember, if you’re traveling to Argentina you can get 50% more on your money by using Xoom to transfer money to the country and taking advantage of the “dolar blue” rate. We rent several Buenos Aires apartments and quite frequently hold luggage for our guests while they travel to other destinations. 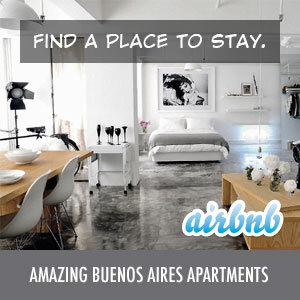 If you’re renting an apartment in Buenos Aires, ask your host if they can help you out. AirBNB is a great place to start your search for an apartment rental too. Unfortunately, neither of the airports (EZE or AEP) offer a luggage storage service anymore. There is some information floating around that says they do, but it is no longer the case. MySpaceBA offers one of the only third-party luggage storage services that we know about. They charge U$S 15 per week or U$S 50 per month for up to 3 bags or suitcases. They also offer pickup and return services within Capital Federal for U$S 20 each. We have heard several positive reviews of their service. Hopefully these tips will help you find a place to store your luggage in Buenos Aires.